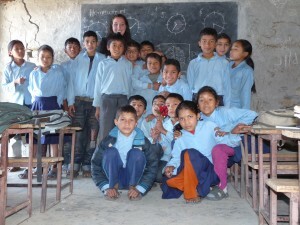 The main aim of our Project in Nepal is education. Even if the education system improved throughout the twentieth century, Nepal is still facing many struggles to date. In most of the mountainous regions, there is still a huge lack of infrastructure. Inevitably, this problem directly affects education since, in the daily routine, kids have to face several challenges to reach the school. Most of the villages are located quite far from the educational centre and, especially during rainy and winter season, it is hard or dangerous to reach it. Furthermore, most of the school are in ruins. Part of the furniture is missing, such as blackboards, tables, and there is usually lack of qualified personnel. This is the main reason why we have decided to give our help to a little village called Karminanda, located 6 hours from Kathmandu and close to the Tibetan border. Our goal is to improve the education system of the village, starting from the restoration of the local school, the Shree Mahendra Navavijayee secondary school. We need your support in order to guarantee these kids a future! 80% of the building of Karmidanda was destroyed, including the school, and nearly 34 people died. We managed to recollect a considerable amount of founds in a short period of time, thanks to the generosity of both private donators and association such as Jugendsozialwerk in Nordhausen. We would like to thank you all for your help and the support demonstrated. The villagers of Karmidanda have been extremely grateful for that. All the founds have been sent straight away to the village and have been used for food, water and medical assistance. On the other hand, there is still a lot to do! Unfortunately the recovery has not been 100% completed and we still need your help. If you would like to donate, you can find all the information in our donate section…and remember: every cents counts! A little step from you, will represent a big step for them and people will be extremely grateful. Would you like to volounteer with us? The small Shree Navavijayee Mahendra Secondary School has approximately 400 pupils and 12 teachers. We are regularly looking for volunteers who would love to teach English in a funny and playful way. The volunteer will be hosted by a local family and travel expenses must be covered by the his/her own. Start: must be agreed in between the volounteer and the organization. Special features: experience the real Nepal and commit to social development.